2015 Aprilia RS4 50 Replica. Picture credits - Aprilia. Submit more pictures. As for its bigger sisters, also the RS4 50 Replica shares the racing livery, with the front profiles of the sides embellished with the colours of the Italian flag and stickers of the technical sponsors, Eni and Dell�Orto. The removable shell transforms it from a two-seater into a single-seater, like a true racing bike. Driveline: Chain, 11/53. Primary drive: Gears, 21/78. Wheels: Light alloy with 6 split spokes, with sealing profile for tubeless tyres; front: 2.75 x 17in. ; rear: 3.50 x 17in. Ask questions Join the 15 Aprilia RS4 50 Replica discussion group or the general Aprilia discussion group. Bikez.com has a discussion group for every motorcycle. Here you may find answers to common questions about the model. If you do not find what you are looking for, you can ask questions. 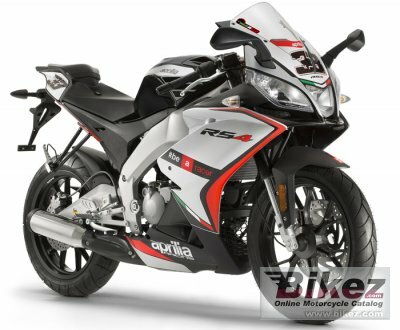 Try out the 2015 Aprilia RS4 50 Replica discussion forum. You can sign up for e-mail notifications when other users answer you. If you have information about any technical issue related to this motorcycle, please leave a comment for other riders.